Made from durable high impact acrylic. Custom fit for your Kia. Made of reinforced acrylic in dark smoke grey, the Vent Visor keeps rain out and lets fresh air in. Vent Visors also reduce heat buildup in parked cars by allowing windows to be kept partially open. Sold in a set of four. 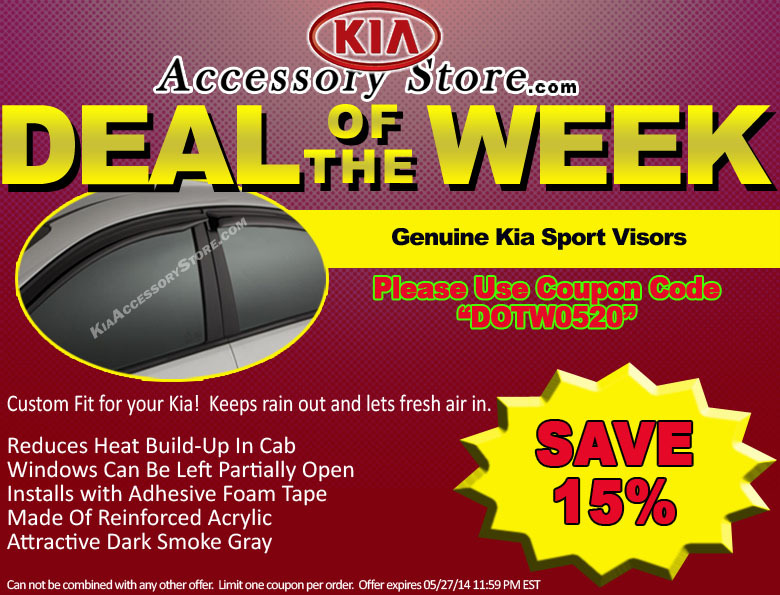 SAVE 15% ON KIA SPORT VISORS - USE COUPON CODE "DOTW0520"
Can not be combined with any other offer. Limit one coupon per order. Offer expires May 27, 2014 11:59pm (EDT). Please call 1-800-509-2652 for complete details.